Comparison of Cormatrix® porcine extracellular matrix and pericardial patch augmentation for tricuspid valve leaflet reconstruction - A singlecenter experience. Citation: Ropcke DM. Comparison of Cormatrix® porcine extracellular matrix and pericardial patch augmentation for tricuspid valve leaflet reconstruction - A single-center experience. Ann Cardiovasc Thorac Surg. 2017;1(1):1-7. Background and aim: Leaflet augmentation to treat restrictive mitral leaflet motion in type IIIB mitral regurgitation is well-known. Leaflet augmentation of the tricuspid valve is less well described. The aim of this retrospective study was to assess short- and long-term valve function and patient outcome in all patients receiving tricuspid valve leaflet augmentation with either Cormatrix or bovine/autologous pericardium in our institution from 2007 to 2016. Materials and methods: NYHA class, diagnosis, type of surgery and health state were found through chart review. Echocardiography exams before surgery, 1 month after, 6 months after, and latest exam were analyzed regarding biventricular function, valve function, leaflet mobility and –thickness. Results: In eight patients; Cormatrix (n=4), bovine pericardium (n=3), and autologous pericardium (n=1) were used for 7 anterior leaflet extensions and 1 septal leaflet extension. Follow-up ranged from 6 to 132 months. Three patients had died, two in the Cormatrix group, and one in the pericardial group. Over time, coaptation length (12 ± 5 mm vs. 8 ± 3 mm, p=0.03) decreased significantly in the Cormatrix group, while none of the other parameters differed significantly. A tendency towards reduced leaflet mobility and thickening of the pericardialextended leaflets were seen over time. Conclusion: Cormatrix and pericardium as patch material for tricuspid leaflet extension are comparable regarding valve performance and durability of the repair in this study, though resorption of Cormatrix material seems to take place leading to decreasing coaptation height. This is a sign of tissue remodelling. Leaflet mobility was reduced in the pericardial repair group and may likely be related to thickening of pericardial patch material that occurred over time. Tricuspid valve repair surgery is performed more and more frequently and has shown superior to tricuspid valve replacement, which is still a problematic procedure due to the thromboembolic risk in the low pressure and low velocity area of the right side of the heart. In more complex valve repair with lack of native tissue, such as congenital defects, infection, fibrosis or calcification, and structural defects, the need for a proper reconstructive material appears. Different synthetic biocompatible materials, e.g. bovine pericardium, Dacron, and other similar materials for surgical reconstruction have been developed continuously, but the non-resorbable foreign materials are associated with rejection, calcification and scar tissue formation . Development of materials for valve repair with bio-regenerative potential and the ability to become histologically integrated with host tissue has been a centre of attention for many years . Apart from biological tissue compatibility and host cell integration, hemodynamic and functional properties comparable to native valve function might be favoured as well . The ideal material for valve repair should be non-infectious, non-thrombogenic and without the need for anticoagulation therapy. The material should be pliable, durable, physiologic, and have the potential to grow. The implantation should not result in scar tissue formation, nor activate an immune response, calcify or shrink. The concept of tissue engineering has led to the development of an acellular bioscaffold composed of porcine small intestinal submucosal extracellular matrix (ECM) or CorMatrix® (CorMatrix Cardiovascular Inc., Roswell, GA, USA). The material is believed to possess growth potential, and the thrombogenicity has proven low . It shows no scar tissue formation, no calcification, and has the potential for integration with native tissue and repopulation with host cells – tissue engineering as a concept . Case reports with few months´ follow-up suggest, that ECM in endocarditis cases is particularly favorable due to low re-infection rates and could be alternatives to synthetic or biological foreign material for damaged heart structures in endocarditis , while other reports suggest, that ECM used for mitral reconstruction in mitral endocarditis needed explantation after few months due to re-infection or perforation . The purpose of the present study was to perform a retrospective single centre chart-and echocardiography review on all patients who underwent tricuspid anterior or septal leaflet extension using either ECM or pericardium as patch material from 2007 to 2016, disregarding the underlying valve pathology. Even though stress distribution and leaflet dynamics might be different in the two leaflets, it was chosen to analyse anterior and septal leaflet augmentation as one group because of the small numbers. The literature in the area is very sparse. The Central Denmark Region Committees on Health Research Ethics approved this retrospective chart- and echocardiography exam study. Patients were found by searching for operation code KFGD10 (reconstruction of the tricuspid valve using a patch) in both the electronic patient file system, and in the West Danish Heart Database, where all cardiac surgery in West Denmark is registered. Preoperative, intraoperative and follow-up data were collected from the charts on all patients undergoing tricuspid leaflet extension with either ECM, bovine- or autologous pericardium from 2007 to 2016. Transesophageal echocardiography exams preoperatively and at follow-up were reviewed, and specific parameters were measured using EchoPAC version 112.1.3., GE Vingmed Ultrasound, AS, Norway. Patients were clinically and with echocardiography followed up by the referring cardiologists after one month, three months, and six months. After six months, the follow up intervals vary depending on clinical state and how the patients had recovered. All patients alive had been seen in the outpatient clinic within the last year of chart review by a cardiologist including echocardiography. All procedures were performed in the same institution and by the same two surgeons through a median sternotomy. Cardiopulmonary bypass with cardioplegic arrest was used in all patients, and closure of VSD´s or concomitant mitral or aortic surgery was performed when needed. The right atrium was entered and valve analysis was performed. Hereafter, an incision was made at the base of the restricted leaflet extending from just beyond one commissure to just before the second commissure, almost detaching the leaflet. Any restrictive secondary chords were severed if necessary. The oversized patch was then sized and fashioned to fit the defect in the leaflet (typically, patches were quite large), and sutured to the annulus and the leaflet covering the space between those two structures. Prolene 5-0, locking sutures, were used. The patch dimension was used for annuloplasty ring sizing (Physio Tricuspid, Edwards, Irvine, CA, US), and after ring insertion the valve was tested using saline testing. The atrium was closed, and the patient was weaned from bypass. Immediate peroperative trans-oesophageal echocardiography was performed to assess valve function. The ECM material was an a cellular, non-cross linked, 4-ply sheet of small intestinal sub mucosal extracellular matrix from pigs, also known as CorMatrix®. Sheets of 7 cm × 10 cm were used and cut into oval patches depending on the size needed. Autologous pericardium was harvested and used with no chemical pre-treatment. Harvesting was performed before annulation and institution of extracorporal circulation. The bovine pericardium used was the Edwards Bovine Pericardial Patch (10 cm x 15 cm), Edwards Life sciences Corporation, Irvine, California, US. Patients were divided into two groups: One group, where leaflet extension was performed using ECM, and another group where pericardium was used. Seven patients received anterior leaflet augmentation. One patient in the pericardial patch group received a septal leaflet extension, and was excluded in the comparison of leaflet length and -mobility between groups. The mobility of a leaflet was evaluated using the mobility excursion angle, which is the angle between the anterior leaflet and the annular plane in max diastole, subtracted the same angle in systole. Data are presented as mean ± SD. Data were following a Gaussian distribution when plotted in a histogramme. Different time point measurements within the same group were analysed using one-way ANOVA, followed by paired student t test, where relevant. p < 0.05 is considered statistically significant. Between January 2007 and December 2016, eight patients were identified (mean age 48 ± 23 years, range 12-68 years) as patients receiving tricuspid anterior leaflet augmentation/extension (n=7) or tricuspid septal leaflet augmentation/extension (n=1). ECM was used in 4 patients, bovine pericardium in 3 patients, and autologous pericardium in 1 patient. There were no significant differences regarding gender distribution, age, NYHA class, annuloplasty ring size, EF, TAPSE or length of hospital stay between groups (Table 1). Concomitant intracardiac surgery was performed in three patients in each group. These procedures included mitral valve replacement (n=1), mitral valve repair (n=2), aortic root replacement (n=1), and VSD closure (n=2). Etiology of tricuspid valve insufficiency is listed in Table 2. None of the patients was receiving chemotherapy nor immunosuppressive therapy at the time of the operation. One patient in the ECM group was a former IV drug abuser, and one in the ECM group received corticosteroid treatment after the operation due to a COPD exacerbation. No patients died within the first 30 days after surgery. In the ECM group, the patient with a former IV drug abuse, died after seven months due to tricuspid re-endocarditis caused by a re-continued IV drug abuse. Another patient died from recurring pneumonia and complications to severe COPD disease eight months after surgery. In the pericardial group, one patient developed lymphoma and kidney failure 18 months after surgery, and died from cardiac arrest 20 months after surgery, without evidence of valve dysfunction at the latest follow-up (Table 2). NYHA = New York Heart Association. LVEF = Left Ventricular Ejection Fraction. TAPSE = Tricuspid Annular Plane Systolic Excursion. ICU = Intensive Care Unit. Table 1: Baseline characteristics. Comparison of patients with extracellular matrix (ECM) patch versus pericardial patch. Patient 3 M 67 5.1.2015 TI, fibrotic restriction Ant. leaflet extension + commisurotomy + Physio tricuspid ring 30 24 months post-op. Patient 4 (re-do surgery) Bovine pericardium M 66 16.1.2015 TI, fibrotic restriction. Former CABG. Ant. leaflet extension + Physio tricuspid ring 32 (+ mitral repair) 24 months post-op. Patient 5 M 68 25.10.2016 TI, endocarditis Ant. leaflet extension + patch in RV (+ AVR + VSD closure) 6 months post-op. Patient 7 Autologous pericardium F 12 29.5.2007 TI+VSD, congenital restriction Ant. leaflet extension (+ VSD closure) 132 months post-op. Patient 8 (re-do surgery) F 17 17.1.2007 TI, congenital restriction. Former ASD/VSD closure. Septal leaflet extension + 3M tricuspid ring 26 120 months post-op. ECM = Extracellular Matrix. F = female; M = Male; TI = Tricuspid Insufficiency;VSD = Ventricle Septum Defect; Ant. = Anterior; RV = Right Ventricle; COPD = Chronic Obstructive Pulmonary Disease; PEA = Pulse-Less Electric Activity; Post-Op = Post-Operatively. Table 2: Individual patient characteristics, diagnosis, surgery and outcomes. Table 3 shows the development over time in NYHA class, valvular and leaflet parameters. Interestingly, tricuspid regurgitation seems to increase after surgery, while the NYHA class improves. There was a significantly longer co-aptation length in the pericardial group compared to the ECM group at 6 months´ follow up. The thickness of the bovine pericardium tended to increase over time, though not significantly. No other statistically significant differences were found between the two groups. Especially no leaflet tears were documented. Pre-Op = Pre-Operatively; Post-Op = Post-Operatively; ECM = Extracellular Matrix; NYHA = New York Heart Association; TV = Tricuspid Valve; IVC = Inferior Vena Cava; AL-SL = Anterior Leaflet To Septal Leaflet; AL = Anterior Leaflet; *P<0.05 Compared to pre-operative value. 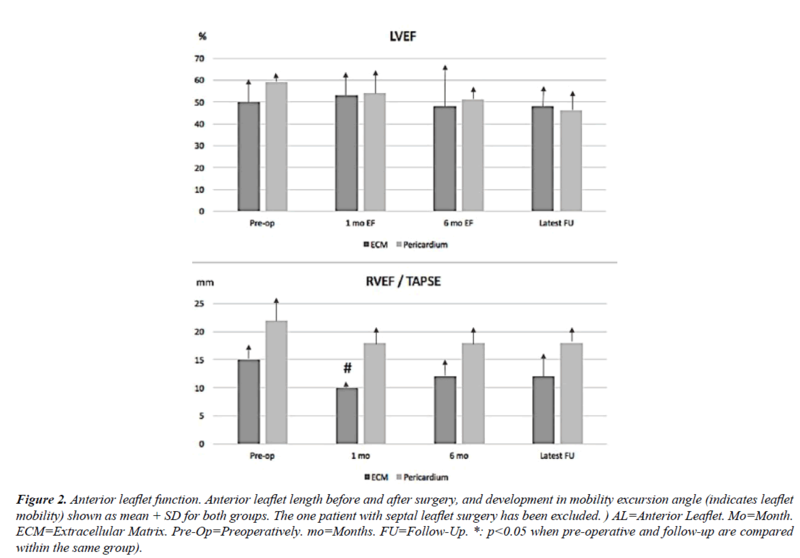 Table 3: Valve function parameters before surgery and during follow-up. Figure 1 shows the development in left ventricular ejection fraction (LVEF) and tricuspid annular plane systolic excursion (TAPSE) during the postoperative follow-up (range: 6 - 132 months). LVEF was lower in the ECM group before surgery, but improved slightly after 1 month, while LVEF decreased steadily throughout the study period in the pericardial patch group. TAPSE was constantly lower in the ECM group compared to the pericardial patch group, with a significant difference between groups at one month follow-up. At the final follow-up, TAPSE improved in parallel in both groups with no statistical difference between groups (Figure 1). Anterior leaflet length and mobility before and after surgery is seen in Figure 2. In both groups, the anterior leaflet length increased slightly over time, though not significantly. The anterior leaflet mobility excursion angle increased from pre-operative 25 ± 16° in both groups to the 1 month follow-up (pericardial patch group: 43 ± 21°; ECM group: 38 ±12°, p=0.006) (Figure 2). The mobility of the reconstructed leaflet improved significantly over time in the ECM group (48± 10°, p=0.03) but worsened in the pericardial group (28 ± 21°). Figure 1: Ventricular function. Development in left ventricular ejection fraction (LVEF) and tricuspid annular plane systolic excursion (TAPSE) in the follow up period. Mean + SD is shown. Pre-op=preoperatively. mo=months. (FU=Follow-Up. #: p<0.05 between the ECM and the pericardium group). Figure 2: Anterior leaflet function. 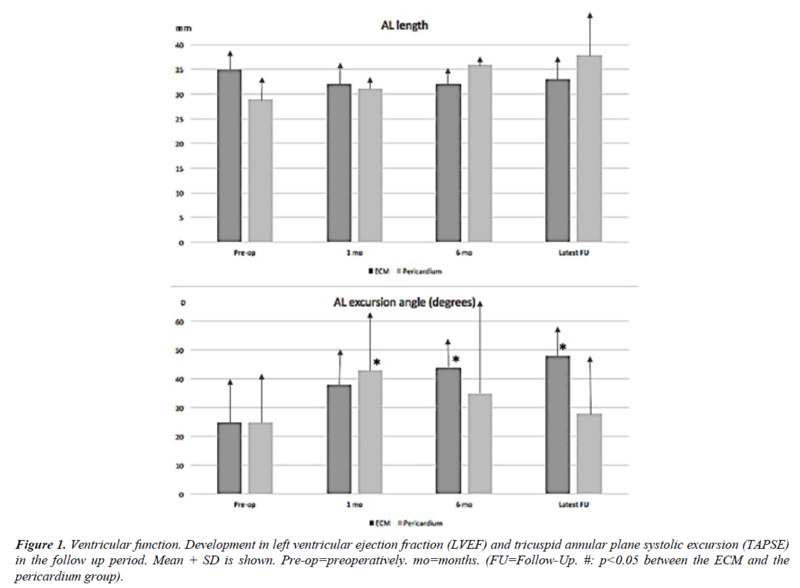 Anterior leaflet length before and after surgery, and development in mobility excursion angle (indicates leaflet mobility) shown as mean + SD for both groups. The one patient with septal leaflet surgery has been excluded. ) AL=Anterior Leaflet. Mo=Month. ECM=Extracellular Matrix. Pre-Op=Preoperatively. mo=Months. FU=Follow-Up. *: p<0.05 when pre-operative and follow-up are compared within the same group). The coaptation length increased significantly from pre-operative evaluation to 1 month and 6 months´ follow-up in both the ECM and the pericardial patch group, but coaptation length decreased significantly from implantation to follow-up in the ECM group (12 ± 5 mm vs. 8 ± 3 mm, p=0.03) At latest follow-up though, coaptation length was still more than twice the pre-operative value (Figure 3). Furthermore, tenting height decreased significantly in the pericardial group after 1 month but increased again over time (Figure 3). No other parameters changed significantly within the same group over time. Figure 3: Coaptation geometry. 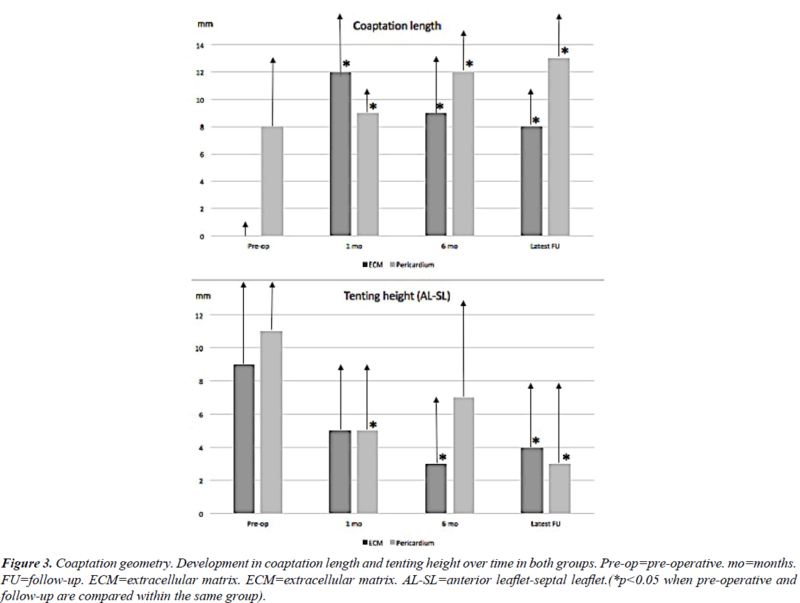 Development in coaptation length and tenting height over time in both groups. Pre-op=pre-operative. mo=months. FU=follow-up. ECM=extracellular matrix. ECM=extracellular matrix. AL-SL=anterior leaflet-septal leaflet. (*p<0.05 when pre-operative and follow-up are compared within the same group). Different synthetic biocompatible materials, e.g. bovine pericardium, Dacron, and other similar materials for surgical reconstruction have been developed continuously, but the non-resorbable foreign materials are associated with rejection, calcification and scar tissue formation . This is especially a concern in reconstructive heart valve surgery, where mobility and pliability is an important feature of the repaired tissue. ECM has been used for partial or subtotal mitral leaflet replacement and leaflet extension to treat mitral regurgitation with severe annular calcification or endocarditis with satisfactory midterm results disregarding the mitral valve pathology, and with an apparent ability to resist calcification and infection . Recently, concern has been rising, since especially mitral valve patch augmentation has shown patch failure in ECM leaflet augmentations with tears and dehiscence . Due to these conflicting findings in the mitral position, one could speculate, that the currently used ECM material would perform better on the right side of the heart or in general in positions, where pressure and stress on tissues are considerably lower compared to the left side. These considerations were the rationale behind the present study. In this clinical follow-up study no leaflet tears were observed, nor were any of the patients re-operated due to tricuspid valve repair failure. One patient with recurrent tricuspid endocarditis due to active IV drug abuse was not offered a re-operation, and died from his disease. Tricuspid regurgitation recurred over time. The complex mechanisms behind tricuspid regurgitation and what constitutes a durable repair are probably not fully understood yet. The observed decrease in coaptation length in the ECM group during six months is interesting but raises some concern. The decrease is explained by the tissue engineering and scaffold material resorption taking place in the ECM material. In the follow-up period, the decrease seems to continue, and the main question is, if and when it stops. In our study period, the coaptation length stays significantly increased after ECM augmentation compared to preoperative measurements, and the length hopefully stops decreasing before coaptation is insufficient. From animal studies it is known, that excessive tissue is resorbed and that remodelling takes place in an appropriate fashion [10,11]. Surplus tissue is expected to be resorbed and only physiologically necessary tissue remains and is repopulated by host cells. Pericardial tissue is not able to remodel and is therefore biologically much more inert. Therefore, the pericardial length remains more or less unchanged. Quite interestingly, a tendency towards thickening of the pericardial leaflets was seen over time together with a decrease in the anterior leaflet excursion angle. This is what we expect to see, since pericardium as patch material is known to calcify and stiffen over time . The parallel thickening and decreasing in mobility is what limits durability and longevity of pericardium as leaflet augmentation material, and warrants a search for better materials. ECM leaflets did not thicken and showed increasing leaflet mobility over time, probably due to tissue engineering and leaflet architecture getting more physiological and “normal” in function. Leaflet augmentation with different patch materials is most thoroughly described for the mitral valve. Gerdisch et al. published in 2014 a retrospective study on 19 patients receiving partial leaflet replacement or leaflet extension in the mitral position due to regurgitation or endocarditis. Follow-up was ranging from 4 days to 48 months (median=10.9 months). The conclusion was that ECM seemed satisfactory for mitral valve repair and it appeared to resist calcification and infection. No mitral valve related events were seen during follow-up. Recently, case reports have emerged leading to some concern, since especially mitral valve patch augmentation has shown patch failure in ECM leaflet augmentations with tears and dehiscence. Kelley et al. showed that ECM leaflet augmentations compared to autologous pericardial leaflet augmentations had up to 32% recurrence rate due to patch failure with ECM at an average time of 200 days after surgery. In the Kelley study on 44 anterior leaflet augmentation patients, no patch failure was seen in the pericardial group in comparison. Over time, the high pressure on the left side of the heart may be a problem regarding longevity and durability of ECM as leaflet extension material in high pressure areas of the heart. For the same reason, new generations of ECM are developing with polymer enhancement and structural improvements compared to ECM used in e.g. the Kelley study. Quarti et al. reported using ECM for cardiac tissue repair in pediatric patients, including 9 valve repairs where ECM was used for leaflet extension. No reoperations or progression of valve regurgitation or stenosis were seen at mean follow up of 12.5 months. Clinical case studies on ECM repair/reconstruction in the tricuspid valve have shown promising results. Most clinical ECM tricuspid procedures have been performed as total valve reconstructions using ECM as a tube graft. Cua et al. reported such successful total tricuspid valve reconstruction in a 26-year-old woman with dysplastic tricuspid valve and a well-functioning tube graft at 1 month follow-up with improved exercise tolerance. Regarding the use of ECM in case of endocarditis, this has been the case in most tricuspid valve reports using ECM. Adler et al. reported the use of extensive ECM tricuspid repair in a patient with recurring tricuspid endocarditis due to an on-going IV drug abuse with a well-functioning valve at one year follow-up. In one of the largest human series with 19 ECM-valve reconstructions in the tricuspid position due to endocarditis, valves were competent in the follow up period of up to 18 months, although papillary muscle disruption was seen in three patients, and re-infection was seen in one case . These different reports suggest that ECM in tricuspid position might have a place, especially in case of endocarditis. In our study, we found that ECM did not tear or calcify over time and that mobility and thickness of the augmented leaflet were preserved in ECM augmented valves compared to pericardium augmented valves. Recurrence of tricuspid regurgitation was seen in both groups. In our study, one of the endocarditis patients with an active IV drug abuse, had recurrent severe tricuspid regurgitation and subsequently died from this. ECM was used in that case together with a tricuspid annuloplasty ring. One could speculate that the risk of re-infection was increased due to the foreign material in the annuloplasty ring. This study was limited by the very small sample of patients reviewed, which might lead to statistical bias. Conclusions are only indicating trends, which should be further investigated in larger scale studies. In this study, follow-up was very variable and ranged from 6 months to 132 months with an average follow-up in the ECM group of 16 ± 10 months vs. 70 ± 66 months in the pericardial group. This off course makes comparison challenging, and focus has therefore been on the one month- and six months´ follow-up primarily. Furthermore, patients, comorbidities and valve pathologies vary a lot. A larger patient population would allow for stratification and subgroup analyses. Both autologous and bovine pericardium were used as one pericardium group, which also is a very rough pooling, since these two types of pericardium differ regarding durability and calcification rates. ECM used as patch material in tricuspid leaflet extension seems comparable to pericardial patch extension and does not show tears or dehiscence in this clinical study with a minimum of 6 months´ follow-up. ECM leaflet augmentation seems to preserve mobility and pliability of the leaflets better than pericardial augmented leaflets. Due to the tissue engineering properties of ECM, a longer follow-up period might show ECM to be superior regarding mobility and durability, compared to pericardial material – at least in the low-pressure area of the right side of the heart. Further studies are needed with longer follow up periods. Professor, consultant Vibeke E. Hjortdal and Professor, consultant Sten Lyager Nielsen are thanked for performing the surgery on the eight patients. Wainwright JM, Hashizume R, Fujimoto KL, et al. Right ventricular outflow tract repair with a cardiac biologic scaffold. Cells Tissues Organs. 2012;195(1-2):159-70. Yacoub MH, Cohn LH. Novel approaches to cardiac valve repair. From structure to function: Part I Circulation 2004;109(8):942-50. Sacks MS, Schoen FJ, Mayer JE. Bioengineering challenges for heart valve tissue engineering. Annu Rev BIomed Eng. 2009;11(1):289-313. Badylak S. The extracellular matrix as a biologic scaffold material. Biomaterials. 2007;28(25):3587-93. Scholl FG, Boucek MM, Chan KC, et al. Preliminary Experience with cardiac reconstruction using decellularized porcine extracellular matrix scaffold: Human applications in congenital heart disease. J Ped Cong Heart Surg. 2010;1(1); 132-6. Sündermann SH, Biefer HRC, Emmert MY, et al. Use of extracellular matrix materials in patients with endocarditis. Thorac Cardiovasc Surg 2012;62(1):76-9. Luk A, Rao V, Cusimano R, et al. CorMatrix extracellular matrix used for valve repair in the adult: Is there de novo valvular tissue seen? Ann Thorac Surg 2015;99(6):2205-07. Gerdisch MW, Shea RJ, Barron MD. Clinical experience with CorMatrix extracellular matrix in the surgical treatment of mitral valve disease. J Thorac Cardiovasc Surg 2014;148(4):1370-78. Kelley TM, Kashem M, Wang H, et al. Anterior leaflet augmentation with Cormatrix porcine extracellular matrix in twenty-five patients: Unexpected patch failures and histological analysis. Ann Thorac Surg 2017;103(1):114-21. Ropcke DM, Ilkjaer C, Skov SN, et al. Small intestinal submucosa tricuspid vavle tube graft shows growth potential, remodelling and physiological valve function in a porcine model. Interact Cardiovasc Thorac Surg 2017;24(6):918-24. Zafar F, Hinton RB, Moore RA, et al. Physiological growth, remodelling potential, and preserved function of a novel bioprosthetic tricuspid valve: Tubular bioprosthesis made of small intestinal submucosa-derived extracellular matrix. J Am Coll Cardiol 2015;66(8):877-88. Sinha P, Zurakowski D, Kimuar TK, et al. Effects of glutaraldehyde concentration, pretreatment time, and type of tissue (porcine versus bovine) on postimplantation calcification. J Thorac Cardiovasc Surg 2012;143(1):224-7. Quarti A, Nardone S, Colaneri M, et al. Preliminary expreince in the use of an extracellular matrix to repair congenital heart diseases. Interact Cardiovasc Thorac Surg 2011;13(6):569-72. Cua CL, Kollins K, McConnell PI. Echocardiographic analysis of an extracellular matrix tricuspid valve. Echocardiography 2014;31(8):264-6. Adler AC, Tewari V, Conlin F. Use of transesophageal echocardiography for Cormatrix based tricuspid valve repair in a patient with recurrent endocarditis. Echo Rounds 2015:120(1):30-3. Gerdisch MW, Boyd WD, Harlan JL, et al. Early experience treating tricuspid valve endocarditis with a novel extracellular matrix cylinder reconstruction. J Thorac Cardiovasc Surg 2014(6);148:3042-48.